Looking for the Elementary Student edition of our Composition course? It's new! Click here. This course is divided into two sections - Rules of Composition, which refers to arranging the visual elements in your image to draw the viewer’s eye, and Photojournalism - using images to tell a story. This course DOES NOT require the student to have any specific kind of camera. They can do this course with a dslr, point & shoot, even a phone camera, whatever they have available. Here’s how the course is set up: There are 16 photography lessons, teaching students how to create visual interest as well as capture the story in their pictures. Each lesson is followed by one or more shooting assignments (30 in all), designed to help your child take the information they read and put it into practice through hands on learning. The suggested rate for going through the course work is one assignment per week, but your student may move through the exercises faster or slower. Student are encouraged to do the work consistently, and at their own pace. Assignments are written in a step by step format with plenty of photographic examples to help your child grasp the information in a more complete way. Each of the photography lessons also has a corresponding quiz. These are meant to be administered by the parent and can be given orally or as a written exercise. This course is offered in pdf format and can be purchased as an immediate digital download or as a digital copy on CD. The course that is currently available is designed for middle to high school aged students. It was created with this older group in mind and is set up for the most part, as an independent study with minimal parent or teacher administration necessary. We are currently remaking this course for elementary aged students! This version will be written in a language that is easy for younger learners to understand and will also contain teaching videos for each lesson. A pdf of the lesson material as well as step by step shooting assignments will also be provided, making sure that students have all the material they need to put the information into practice behind the camera. 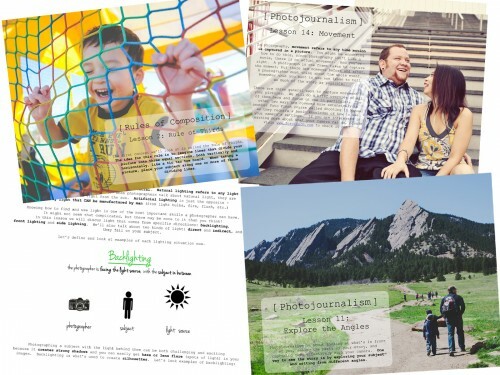 Stay tuned for this version of the Composition & Photojournalism course, created specifically for younger students! To receive notifications and periodic discounts/promotions for Foto Finch products, please email us at ernie@fotofinch.com with the word "Notifications" in the title.